The insurance industry is a competitive field to be in. Especially now when customers can “shop-around” by analyzing the reviews, stories and comments published by previous insurance customers. With so many companies to choose from and published pieces to influence customer choices, how can companies in the insurance industry retain the interest of would-be and current customers? The answer involves quick, helpful and all around good service, as well as a standardized system of employee performance measurement to maintain high customer satisfaction. This is where Key Performance Indicators (KPIs) for insurance company underwriting processes come in. What are Insurance Underwriting Processes? Insurance Underwriting processes are defined as the series of actions insurance company underwriters use to evaluate the risk level of potential clients to decide coverage amounts, premium amounts, or if the client will be rejected or accepted for an insurance policy. Underwriting guidelines will vary by company and by what type of insurance is being evaluated. For example, auto insurance will consider different guidelines than home or life insurance. Regardless of the insurance line of business, all underwriters are responsible for making calculated risks and ensuring that premiums offered to potential clients match up with the level of risk. What are Key Performance Indicators (KPIs) for Insurance Company Underwriting Processes? As mentioned in the first article of our KPI 101 series, Key Performance Indicators (KPIs) for Insurance Company Underwriting Processes are defined as quantitative and qualitative metrics for measuring underwriting processes, which are utilized by the insurance company to monitor a variety of underwriting processes over a set period of time, which are then compared against previously set goals within the underwriting department. This brief list highlights some of the many benefits that can be unearthed from measuring key KPIs for insurance companies. Below are 4 KPIs for insurance underwriters every insurance company should be tracking to make sure they are meeting the growing demands of both the customer, and the company itself. Customers expect things to be done immediately, especially when it involves something as important as obtaining an insurance policy (a process that involves an initial coverage discussion, underwriting handoff and processing, and finally, placing the insurance policy in the hands of the customer). Though some time is needed to underwrite an insurance policy, taking too long is not advised as that will reduce the customer’s experience, and have them seeking out other insurance providers for quotes. As such, use the Cycle Time: Insurance Coverage Offer KPI to measure the average number of calendar days required to process an insurance policy, from the time the offer for coverage is given until the time the insurance plan is approved for issue after underwriting. A low value for this underwriting key performance indicator should be sought after since high values can be indicative of low underwriter productivity rates and/or an uncoordinated process flow. This can involve a low level of interaction between customer-facing insurance representatives and underwriters, inefficient insurance approval procedures, etc. Nobody likes their time to be wasted, especially when they have just gotten a new car and are comparing auto insurance company quotes. It’s one thing for an insurance underwriter to be meticulous and spend a lot of time making a decision on an insurance policy because something went wrong, but it’s another thing entirely if an abundance of time is spent on applications that are ultimately denied. To measure the frequency of this occurrence, use the Percentage of Insurance Applications Approved insurance industry KPI to measure the quality of the insurance application process. This KPI for insurance underwriters is defined as the division between the number of insurance applications submitted by potential policyholders that are approved and paid (first month’s premium), and the total number of applications submitted by potential policyholders over the same period of time, as a percentage. Being able to spot applicants whose applications are unlikely to be approved EARLY on during the new business processing cycle is key to eliminating low-value work for insurance underwriters. This works both ways. Customers do not want to wait around to be told that they need to look elsewhere for coverage. Most insurance companies have a service level agreement (SLA) outlining standards in regards to customer service. Most of them, however, do not formally track adherence to these standards. This can result in increased SLA failures (whether because employees took too long to handle customer requests, or because the employees didn’t know how long they had to take care of the customer in the first place), reduced customer satisfaction and potential financial and legal ramifications (e.g., refunds, litigation, etc.). To prevent any of these instances from ever happening in your insurance underwriting function, use the SLA Adherence: Underwriting Decisions insurance industry performance metric to measure the percentage of underwriting decisions that are made within the time specified in the insurance company’s SLA. Not only does tracking this insurance industry key performance indicator help to ensure that the insurance customer stays happy, it can also help underwriting managers identify specific underwriters who consistently breach the SLA, and thus need to be further coached to increase performance. In the end, this insurance industry KPI helps standardize the insurance underwriting process and keeps everyone on the same page concerning how long the process should take. While this KPI for insurance underwriters is a little bit different than the others, measuring it allows managers to gain further insight into the what part of the insurance underwriting process needs to be improved from a cost KPI perspective. That said, use the Underwriting Expense Ratio (P&C) insurance industry KPI to measure the division between the total cost the insurance company incurs when performing property and casualty (P&C) insurance policy activities (selling, underwriting, onboarding and maintaining P&C policies) and the total P&C premium earned over the same period of time, taken as a percentage. 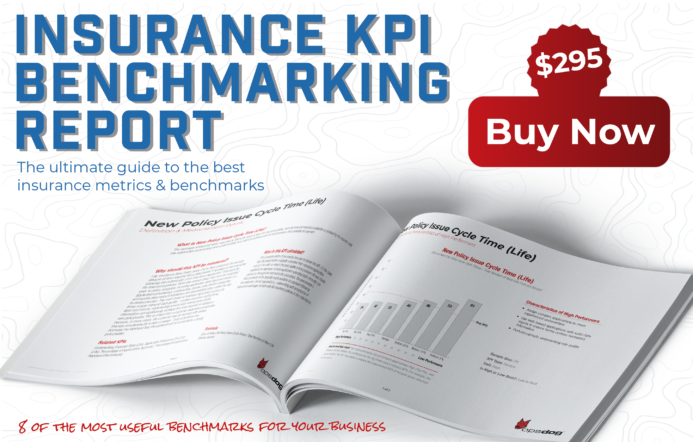 A relatively low value for this insurance industry KPI should be your department’s goal since relatively high values can indicate that there are several issues that need to be addressed. For instance, high values can mean that strategies the insurance company is currently using to target would-be customers and sell them insurance policies are not garnering sufficient interest, the underwriting process is being bogged down by highly manual processes (e.g., data re-entry, missing customer information that needs to obtained, etc. ), there exists sub-par insurance employee (underwriters, representatives, sales staff, etc.) productivity or training, a high number of customers are not renewing their policies with the company, etc. The above insurance KPIs and metrics are only a small sample of those available to track processes and activities within the underwriting department. Only by knowing what specific area(s) of the underwriting process needs to be addressed, can insurance managers take the necessary steps to improve them and keep operating costs low. This is important to insurance companies since they rely on the investment of excess funds to maintain the company’s profitability, to cover claims payments, and to further develop their insurance policy distribution channels. There are numerous other insurance industry KPIs to analyze, but keeping an eye on these four KPIs for insurance underwriters will definitely give you the head start you need to entice new and current customers. 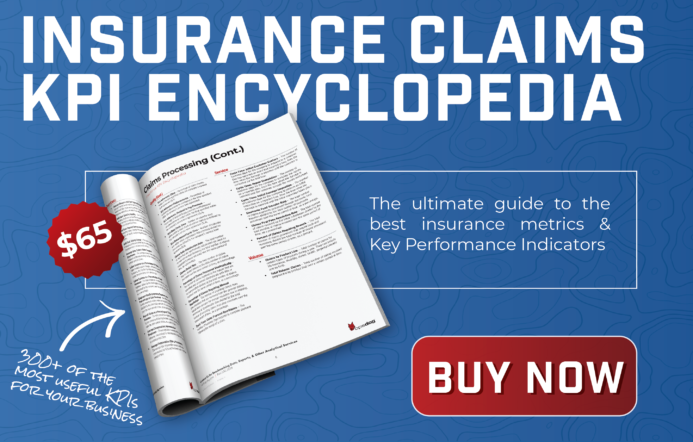 Looking for a full list of Insurance Key Performance Indicators? 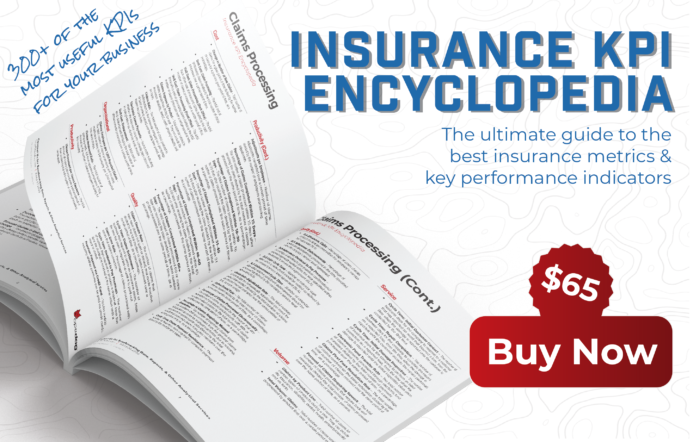 Download our Insurance Key Performance Indicator Catalog here. Sign up for our email newsletter to be notified when we produce new content.